I can almost taste it! Imagine – fresh locally grown asparagus with taste of garlic and leeks, topped with cream and homemade croutons…. That’s what I am making for dinner tonight – try it as well! In a large, heavy saucepan, heat half of the oil over medium heat. Cook shallots and 3 cloves of garlic, stirring occasionally, until shallots are softened – about 3 minutes. Add leek, cook, stirring until softened – about 6 minutes. Stir in asparagus, salt and pepper; cook for 2 minutes. Add vegetable broth and bring to boil. Reduce heat and simmer until asparagus is tender – about 5 minutes. In batches in a blender, puree soup until smooth. Return to saucepan over medium heat – stir in cream and lemon juice. Bake at 450F oven until golden – about 8 minutes. Combine sour cream with chopped chives. 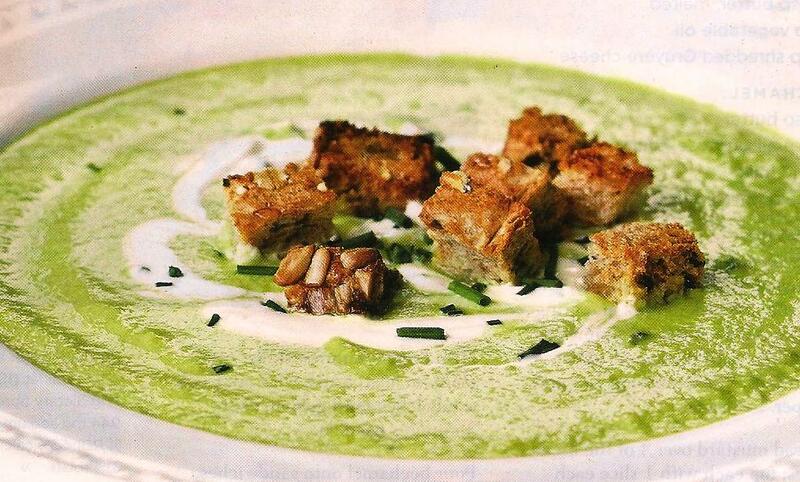 Dollop cream mixture on each bowl of soup and sprinkle with croutons.